This is the Booq Python Pack. As its name would suggest it's capable of storing a great deal of kit, heavily focusing on photography gear. The concept of this backpack, is to carry all the gear a tech savvy user would want to take with them. It’s capable of storing a notebook of up to 15 inches, a tablet, up to two DSLR cameras, four mid-sized lenses, an abundance of cables, and plenty of pockets, pouches and general free space is also available for creative storage of other items. The Python has a well designed sleek exterior and the intrinsically well thought out characteristics of this have been emulated on the inside of the bag too. The Python is available in just one colour and is made from a versatile grey 1680D nylon material. There is absolutely no doubt that this is a sublimely well built bag. The bottom of the bag has a thick and highly grippy rubber base and this is reinforced with padding for dependable protection of the internal equipment if the bag is abruptly dropped, something that is especially important if you plan on taking the Python with you on your more distant travels. The entire construction of the Python Pack is rigid and boldly resilient to strain and stress. Substantial thick airmesh padding is located along the adjustable shoulder straps and on the rear of the bag for increased comfort, and it also allows your back to breathe and the inside of the bag to breathe too. Along the shoulder straps are two optional to use buckle clips that strap the Python securely around the chest area of the body making it feel more definitely secure. For simple lifting and manoeuvring there is a strong carrying handle at the top of the bag. The exterior nylon material is also water-repellent and does a good job of keeping out water from moderate rainfalls. For heavy rain and bad weather conditions a removable Poncho is found within a zipped pouch on the far right of the bag and is clipped onto a fob within the bag. This is designed to be quickly applied over the front of the Python Pack and in practice it works as expected. Now moving onto the storage area of the Python; the interior design is simplistic and well thought out. The user can easily and quickly obtain any item stored within the Python Pack and this is always a factor we put highly at the top of our list of bag credentials. The main area of the Python Pack is made to store camera gear neatly. This fully padded compartment is located on the left side of the bag (when the bag is on your shoulders) via a zipped flap; the inside of this flap has a large sewn-in pocket that is useful for storing things like cables. Adjustable densely padded velcro dividers allow the user to setup a custom storage area for their DSLR camera(s), lenses, flashes, microphones and other accessories. Because this area is on the side of the bag it means the user can swing the bag in front of them on its side, whilst one shoulder strap is being worn, and access the contents of the section hastily. This highly adjustable and very easily accessible storage space secures all items firmly in place and we really appreciate this functionality as frequent photographers ourselves. Included behind this pouch is another zipped pocket with a separate removable pouch inside which is ideal for storing filters or cables. On the opposing side to the camera section is another zipped compartment that has inside a variety of different sized pouches for pens, magazines and cables. On the inside of this flap are two zippered mesh-layered see-through pouches for accessories like cables, chargers and small items. Behind the right flap, near the back of the bag, is a zipped thinnish pouch which can store an iPad with a case attached or any other similar sized tablets. Along the rear of the bag is a zipped pouch that can fit a notebook computer of up to 15 inches. The MacBook, MacBook Pro and MacBook Air notebooks up to 15 inches will all fit without trouble, but other notebook brands that are quite a bit thicker than the thickest Mac notebook in the current lineup, that being the MacBook Pro, may possibly not fit in the Python. 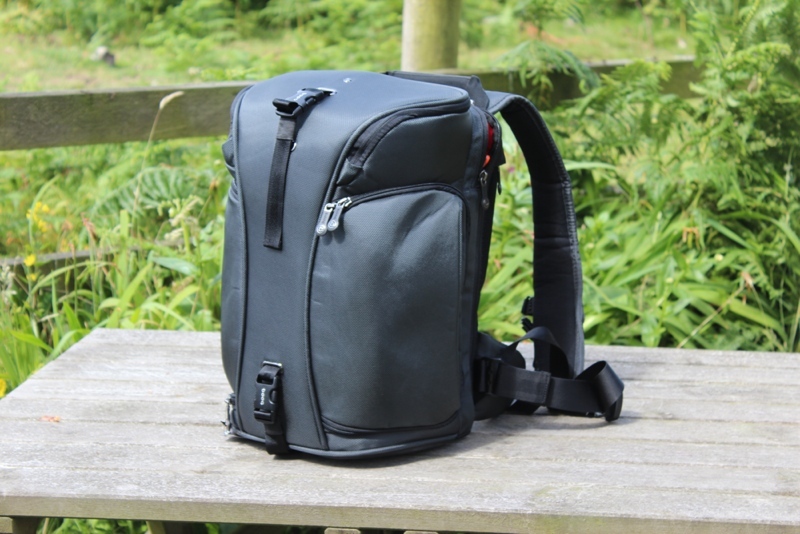 On top of the Booq Python Pack is a large zipped compartment which also includes an adjustable velcro divider. This area could be used to store a host of many different things. We chose to store audio equipment here as detailed in our photo, but it could be used for another camera, your lunchbox or whatever else is needed! The inner flap also has another see-through mesh layer attached for even more additional storage, ideal for things like camera batteries, flash cards and lens filters. Each shoulder strap has a zipped neoprene pocket pouch which for reference will fit the iPhone 5 snuggly. Both of these pockets are great for smaller items like very compact cameras or GPS’s which can then be easily accessed. On the outside front of the bag are two clips that we used together to hold a tripod, but could be used individually for an assortment of other bits and pieces. The Python has the unique Terralinq facility which is a digital lost and found service created by Booq. This is essentially a serial number which the owner of the Booq Python Pack can register on the Terralinq website. If you should subsequently lose the bag then anyone finding it can go to the website displayed on the Terralinq serial number badge and report its whereabouts. Booq have put a lot of time and thought into designing this bag with its multitude of storage areas and rigid construction. We would definitely recommend it to professional and novice photographers alike, as its capabilities of storing a digital life on your shoulders, in a stylish and easily accessible package, must be applauded.